A spicy sauce typically made of chili peppers and any number of other ingredients. Hot sauce may also contain water, vinegar, salt, or various fruit or vegetable pulp such as mangoes or carrots. A smooth liquid or sometimes a thick paste typically red or brownish in color that comes in small glass bottles. Typically made with some type of peppers, such as chipotles, jalapenos or cayenne. Flavors: Mildly spicy to very spicy depending on peppers used. 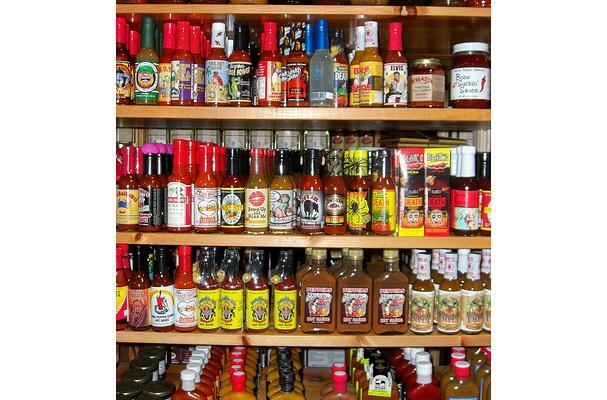 Choosing: Depending on the level of spiciness you enjoy; you can choose from milder hot sauces made from jalapenos or chipotle or for a hotter spice you can choose sauces made with peppers such as habanero or Tabasco. Buying: Widely available at most stores. For the 'specialty' or extra hot sauces you can try local spice stores. Procuring: Hot sauce is usually made from peppers that are typically grown in warm tropical areas where it can be cultivated year round. Hot sauce is usually used in stews or chili in the U.S. but it can also be used it vegetable and bean dishes. Many also use it as a condiment and add it to various meats, such as chicken wings. Variations of hot sauce are used all over the world but are especially popular in America. Mexico and Asia. History: Evidence of variations of hot sauce of chili sauces can be found as early as the 1800s in the U.S. These early sauces were especially popular in the South. In the late 1800s, the Tabasco brand of hot sauce became one of the earliest mass marketed versions of hot sauce that was and still is available.